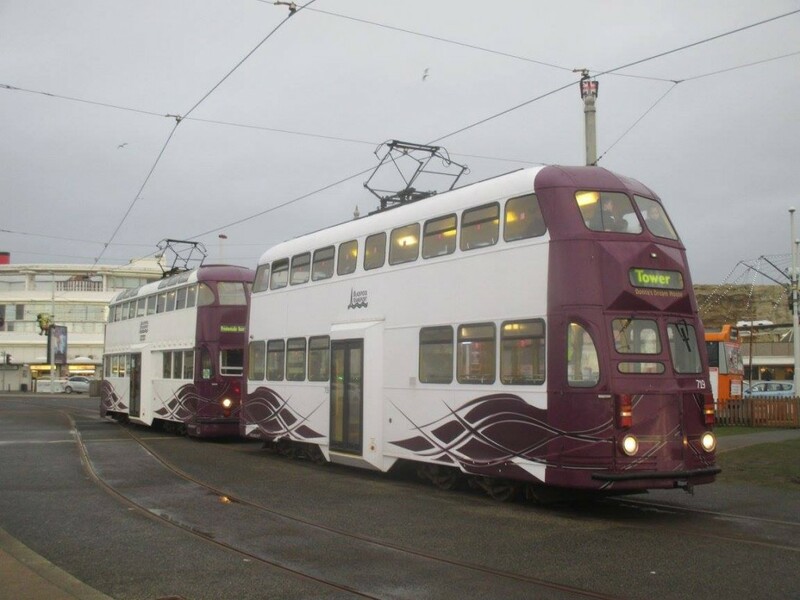 The second ‘gold’ operating weekend for Blackpool Heritage Tram Tours took place on 25th & 26th February, with the now well established formula of six trams running to a timetable including one trip each to Fleetwood once again being used. This time however, there was the added novelty of a temporary heritage stop provided at St Chad’s Road, to serve a model tram event taking place that weekend at the Lyric Hotel. The model event, organised by the Tramway & Light Railway Society, is now in its third successive year and has become a popular and welcome addition to the tram events calendar at a traditionally quiet time of year. 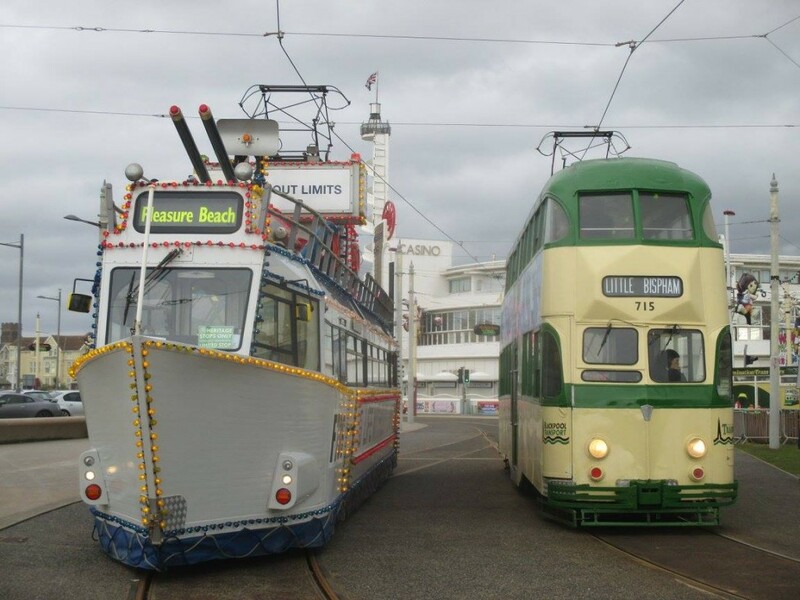 Whereas this was a standalone event in 2015, this year and last it has been jointly promoted with the heritage service and both seem to have benefitted, with plenty of tram passengers going to visit the model show over the weekend and see some considerably smaller trams after enjoying their full size counterparts! Indeed, with a new event in ‘Totally Models’ mooted for the June heritage event weekend, it seems that the connection between model and real trams is seen as a good way to increase interests in both sides, and represents co-operation between organisations and individuals to mutual benefit, at its best. Moving on to the real tramway, and Saturday 25th February saw the illuminated Frigate 736, Railcoach 680 and Balloon cars 700, 717, 719 and 723 all in action. There was some disruption in the morning as 723 suffered a problem with its tail lights before embarking on the 1000 Pleasure Beach to Fleetwood service and was sent back to the depot for repair, with 700 - which had been due to work the 1015 service from Pleasure Beach – taking its place on Route A with the first Fleetwood tour of the day. To the credit of the workshop staff at Rigby Road, 723 was repaired extremely quickly and sent back out, taking over from 700‘s allocation for the day, meaning that disruption was kept to a minimum. One other change was the unexpected use of car 719 as flat-fronted 718 was an early failure; this tram has broke down on both times it was due to run so far this year. Maybe it feels increasingly embarrassed to be going out in a state of undress (it remains plain white after the removal of its advertising vinyls last summer)!? Otherwise, the day went very well in spite of poor weather and there were no further issues for the rest of the day. Sunday 26th February once again saw a few changes to the advertised tram output, with Centenary car 648 and Western Train 733+734 both unavailable: they were replaced by Railcoach 680 and Frigate 736 respectively. Also in service were Box 40, Bolton 66, and Balloons 700 and 715, with the latter recording its first use of 2017. The use of 66 proved rather optimistic as the wind grew increasingly strong as the day wore on, and it was duly swapped over for Balloon 723 in the afternoon, presumably to the relief of its crew! The other trams completed a full shift on service without any reported incidents. Despite a few challenges, the heritage team managed to put on a good show with nine different traditional trams running over the weekend. With power now restored to the Rigby Road site following completion of the depot roof repairs just in time for the weekend, this should make things much easier and hopefully will benefit the next events on the Blackpool tramway. Thanks to 718's strop in the morning, Saturday 25th February saw two purple Balloons in use. 719 and 700 were both captured at Pleasure Beach in this shot. This entry was posted in Blackpool Tramway, Models. Bookmark the permalink.